Statue of Liberty: Grover Cleveland was the 22nd and 24th American President who served in office from March 4, 1885 to March 4, 1889 and from March 4, 1893 - March 4,1897. One of the important events during his presidency was the dedication of the Statue of Liberty. Summary and definition: The Statue of Liberty was conceived by Edouard de Laboulaye, who proposed the monument as a symbol of friendship between France and the United States. The sculptor and designer was Frederick Auguste Bartholdi who hired Alexandre-Gustave Eiffel as the initial internal designer of the structure. The massive monument, with its distinctive green patina, soars above 300 feet and is located on Liberty Island in New York Harbor. 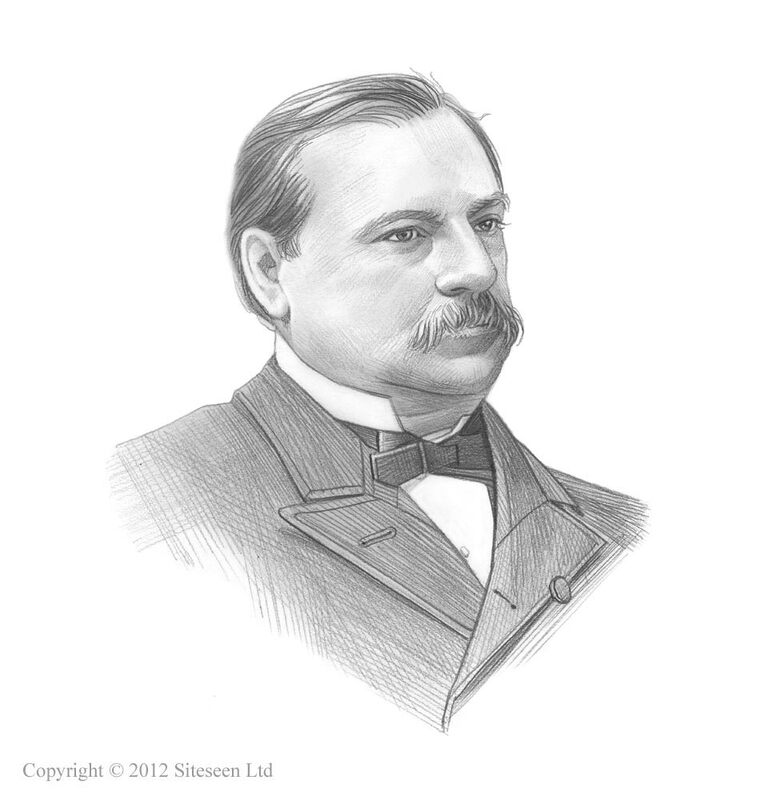 The dedication celebration took place on October 28, 1886 attended by President Grover Cleveland. There are several FAQ's (frequently asked questions) asked about the Statue of Liberty and this is a good place to start when learning about fast, fun and interesting facts about this important symbol of the United States of America. She is 151 feet 1 inch (46 meters) tall. The total height of the monument is 305 feet 1 inch (93 meters) from the ground to the torch. It is believed to be the tallest metal statue ever made. What is the Statue of Liberty inscription? The inscription on the tablet held in the left hand is inscribed with the date of American Independence, July 4, 1776, written in Roman numerals and reads July IV MDCCLXXVI. The seven spikes of the crown are rays of light representing the seven seas and seven continents of the world. History and interesting info about the Statue of Liberty Facts for kids are detailed below. When was the Statue of Liberty built? Construction started on September 1875 and the monument was completed in July, 1884 and arrived in New York Harbor in June of 1885. Why was the Statue of Liberty built? It was built by France to celebrate America's first 100 years as a nation and the tablet is inscribed with the date of American Independence. The monument commemorates the alliance between the United States and France during the Revolutionary War. The idea for the statue is credited to Edouard de Laboulaye, a French political intellectual and anti-slavery activist, who proposed the monument, a symbol of friendship between France and the United States, should represent Liberty. The designer and sculptor was Frederick Auguste Bartholdi (1834 – 1904). It is said that the face was modeled after Bartholdi's mother, Charlotte Bartholdi. The monuments original name was 'Liberty Enlightening the World'. He also created the Bartholdi Fountain located in Bartholdi Park, United States Botanic Garden, Washington, D.C.
Bartholdi hired Eugene Viollet-le-Duc as the initial internal designer of the structure but he died in 1879 and Bartholdi hired Alexandre-Gustave Eiffel as his replacement. There is a replica in Paris on the Ile aux Cygnes which faces west, in alignment with the monument in New York. On February 22, 1877, Congress voted to accept the gift, and set apart Bedloe's Island for the site. History of the Island: The island was originally part of the Oyster Islands Chain", then named Love Island. It was re-named "Bedloe's Island" was named after the new owner, a Dutch Colonist called name Isaac Bedloe. History of the Island: The island was then used as a quarantine station for small pox and sold to the city of New York in 1758. Fort Wood was in 1807 to protect New York City from British invasion during the War of 1812. She was transported from France on board the French frigate "Isere". Whilst in transit, she was reduced to 350 individual pieces and packed in 214 crates. Its official presentation to the minister of the United States took place July 4, 1884. The dedication of monument took place October 28, 1886 during the presidency of Grover Cleveland. The Dedication celebration was a great event attended by President Cleveland, General Sheridan, the members of the President's cabinet and the sculptor Bartholdi together with thousands of people with parades, music, flags and gunshot salutes. Every bell in New York harbor was rung. It would later become the iconic landmark for all European immigrants on the last leg of their journey from Europe to Ellis Island and a new life in the United States. The Black Tom Explosion, perpetrated by German saboteurs on July 30, 1916 during World War 1, rattled the Statue of Liberty so badly that the torch, which had been open to the public for 30 years, had to be closed. The ladder to the Lady Liberty's torch is still is closed, and has been since the 1916 explosion. The photograph of the Statue of Liberty was taken in 1917. June 3, 1980 the Bombing of the Statue of Liberty: A time delayed explosive device was detonated at 7:30 pm in the Statue of Liberty Museum Story Room. There were no injuries but the bomb destroyed many of the exhibits and caused $18,000 in damage. No arrests were made but the bombing was believed to be the work of Croatian protestors. Between 1984 - 1986 restoration work and repairs to the Story Room were completed and some parts of the statue had to be completely replaced with exact replicas of the original. It's centennial was celebrated on July 4, 1986. Liberty Island was hit by the storm surge from Hurricane Sandy on October 28, 2012. It was closed for eight months Liberty Island and reopened on July 4, 2013. The stats and facts provide interesting, little known details about the dimensions and statistics of different elements of this great American icon.